When I started making YouTube videos I had 0 Views and 0 Subscribers. I never had a video go viral, I never had a breakout video that got me noticed, and I didn't get shoutouts for big YouTubers on the platform. I still grew from 0 subscribers in July 2013 to over 300,000 subscribers and 21,000,000 views, and I did it the hard way. If I were starting a YouTube Channel today, then this information would have been important to me. While I understand that some of you will have some skepticism around this and feel creators with 100,000 or more subscribers are out of touch and don't remember what it is like to be a Small YouTuber or just getting started, nothing could be further from the truth. Most creators that you know that have reached higher numbers, didn't do so with their first channel or their second channel. In my own case, I left my channel for dead, having started in 2009 and done virtually nothing with it until the summer of 2013 when I started putting out weekly content around Photoshop and Premiere Pro Tutorials. Over the years I've helped many creators start channels through 1-on-1 Coaching, or through Mentoring in Awesome Creator Academy. I've watched with my own eyes, creators go from 4,000 subscribers to 80,000 in a year, from 1,000 to over 1,000,000 in 2 years, and none of the got LUCKY... they all worked hard, and more important worked smart and let go of their assumptions. Nobody is entitled to an audience, it is something that one earns. If you are committed to doing the work, then I am committed to giving you the advice that myself and others have used over the years to forge our own success, experience creative and financial freedom, and build a community from the ground up. How is this different than the paid courses from myself and other YouTube instructors? 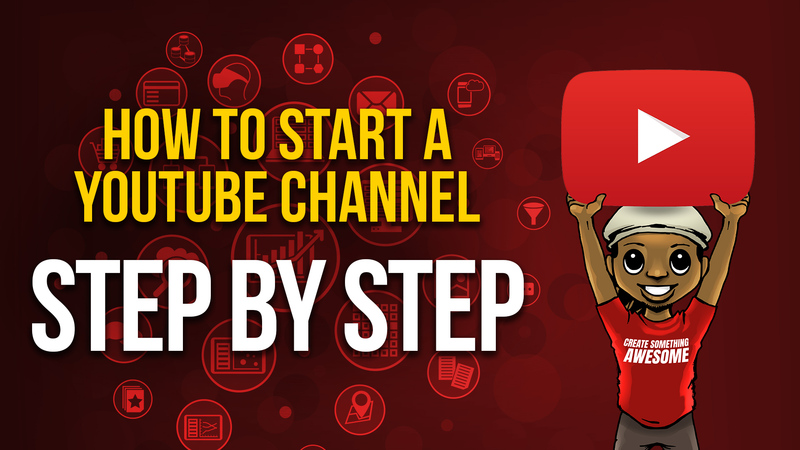 This free tutorial is an in-depth walkthrough of how to start a YouTube Channel from the technical point of view. It will teach you what gear you will need, what camera settings to use, how to record, edit, and set up a basic YouTube Channel. However, The Formula for Awesome Videos goes into specifical detail about making quality content by planning and scripting your videos, using specific film techniques, preparing your b-roll footage, and planning the structure of your video content. Other courses like the YouTube Analytics Crash Course, focus in great detail on specific aspects of YouTube as a platform. The YouTube Starter Kit isn't even a course, it's a graphics pack with over 160 assets for Photoshop and Canva to help you master the visual branding of your YouTube channel without being a master of Photoshop or design. There are other resources like access to free fonts, royalty free music and some training on growing your channel successfully. If you want your channel to look more professional, and you feel like better thumbnails will help you get more clicks and views for your channel, then the YouTube Starter Kit is for you. Built tremendous relationships with people within the community like Evan Carmichael, Shonduras, and Tay Zonday. YouTube made me more confident as a person and has been a tremendous outlet for my creativity and expression. It helped me conquer my insecurity and introversion and become someone capable of public speaking. Starting a YouTube Channel demands something very important if you want it to be successful, regardless of how you definite success (views, subs money, recognition, engagement). YouTube success, like many things in life, demands consistency. There is more to consistency than getting out a weekly or daily video, it's more than making sure the quality is always there, consistency is about your message and how you maintain the relationship with your audience. Consistency is also about your character and how you present yourself. People will tell you to be yourself, but what they don't tell you is that it keeps you future proof, it is the most sustainable thing there is. So if you're the same person on and off camera, the odds are better that you won't burn out and you can get through the hard times, and suffer through the haters, the platform changes and everything else. When I made my first video on my main channel in 2009 I was horrible at it. The first few videos weren't much better, and I never was consistent at making videos until 2013. For 4 years I only uploaded about 10 videos because I lacked any confidence in being on camera to begin with. So how did I go from that to 1,100+ videos and millions of views? Getting started on YouTube is very straightforward, but I will warn you, it's not practical to start YouTube thinking about subscribers. Subscribers come later. Think like a dancer or a musician, you don't start by worrying about the people in the crowd or the stands, you have to learn your craft, and you have to practice and be good enough to EARN an audience in the first place. It takes more than hard work, you need a competitive advantage and you need at least some talent. My natural talent was not being on camera or public speaking. I was very bad at it because I was awkward and nervous and honestly not even confident in my own appearance. You might be feeling similar things. What helped me was focusing on my actual talent and skill, I was good at software and so I started making screen recording tutorials teaching the software I was good at. I became more comfortable talking to an audience if I didn't have to be on camera all the time. This was my real first step toward growth. When I watch those early videos, I internally cringe at just how bad I was. But if I hadn't at least tried and practice it, I wouldn't have gotten comfortable and better at it and learned to love the process of making videos. It started out as something that was very uncomfortable and a bit draining for me. There also there weren't many videos on "how to start a youtube channel" at the time, or if they were I couldn't find them for whatever reason. So I had to learn everything the hard way, yo, of course,e have this tutorial! I think it's important for me to give you an overview of YouTube before we get started on the process of starting your channel. YouTube can get complex, so I will attempt to simplify some of the basics here. YouTube allows you to upload video files to the website to be shared with viewers. There are several types of video file formats that YouTube supports: MP4, AVI, MPEG4, WMV, FLV, ProRes, CineForm, WebM, DNxHR, HEVC, and 3GPP. When you upload a video to YouTube it is typically uploaded in 1080P resolution or 4K resolution and then the video is processed and has a file created for lower resolution formats including 720p, 480p etc. If you upload a 1080p it is not upsampled to 4K video, there may also be some quality compression, so make sure you are producing and rendering your video in the highest quality possible before uploading to YouTube. YouTube supports HDR Videos, however, HDR videos must have HDR metadata in the codec or container to be played back properly on YouTube. You can also use your Webcam to Record to YouTube. With either your webcam from your laptop or an external webcam you can record to YouTube or you can live stream on YouTube as well. If you have a video capture you can also use a DSLR or Mirrorless Camera or even a multi-cam setup in order to broadcast on a YouTube live stream. 360 Video is also capable of being uploaded to YouTube. It isn't necessary to have an expensive camera to do quality YouTube videos and to grow a YouTube channel. I grew my channel to 100K subscribers on very modest equipment, my camera didn't even have a flip out screen, it was the Nikon D3200 and I used a $30 Sony clip-on mic, and that quality was enough to get me 100K subscribers and millions of views between July 2013 and February 2016. You'll ideally want a YouTube camera to have a flip out screen, interchangeable lenses or a zoom lens, and a microphone input jack. However today I would recommend you absolutely use a camera that has a flip-out screen if you intend to film yourself on camera unless you have someone behind the camera to help you. When filming for YouTube you should avoid using Automatic settings, these are not intended for the type of content you want to make and will negatively affect quality in ways you may not expect. Shutter speed 1/60, Aperture: f/2.8 or F/4.0, ISO: 100 or as low as possible, not higher than ISO 1600, WB- Set White Balance to what looks good in your location, NO AUTO. Shutter speed 1/50, Aperture: f/2.8 or F/4.0, ISO: 100 or as low as possible, not higher than ISO 1600, WB- Set White Balance to what looks good in your location, NO AUTO. Shutter speed 1/120, Aperture: f/2.8 or F/4.0, ISO: 100 or as low as possible, not higher than ISO 1600, WB- Set White Balance to what looks good in your location, NO AUTO. Your camera lenses are a big part of getting the look of your videos right. When you are first starting out the KIT Lens that comes with your camera in most cases is good enough for most of your needs and will give you some flexibility. However, if you want to make your videos look like the "Pro YouTubers" with a blurry background (bokeh/depth of field), then you will need a lens with a wide aperture of F/1.8 or F/2.8 at least. The way to do this affordable is to get a 50mm F/1.8 lens or 35mm F/1.8 lens. This will help you get to higher video quality without breaking the bank. If you want to do product shots for review videos, a 24mm, 60mm, 90mm, 105mm macro lens will let you get amazing high-quality shots that look straight out of a television commercial. These are relatively expensive but not as expensive as professional zoom lenses. Zoom lenses with an aperture of F/2.8 are used by DSLR filmmakers and professional photographers. When it comes to YouTube videos, there are only a few focal lengths you generally need, these are used by larger creators like iJustine, Casey Neistat, and Sara Dietschy. The focal lengths are 12-24, 16-35, 24-70, and if you happen to be shooting an event or a travel videographer 70-200mm. Justine and Sara in most cases use the 16-35mm F/4.0 and 70-200mm F/4.0 lenses which typically cost half of the F/2.8 lenses, and for general shooting 24-70mm F/2.8. You can have lapses in video quality, but audio quality will make or break the experience for viewers when it comes to YouTube. The good news is that quality audio doesn't have to expensive to be acceptable, unlike video quality. I used a $30 clip-on mic from Sony in the early days of my channel, and that microphone is what I used until I was over 100K subscribers on YouTube and my audience was fine with the quality. Until recently the I used a $60 Audio-Technica microphone for my screencast tutorials and live streams before upgrading that equipment as well. If you are filming traditional YouTube videos where you are talking to a camera, I recommend using a clip-on microphone, wired or wireless when you're just getting started and wear it under your clothes if you want it to look professional. If having a mic on you is too distracting, then you'll need to use what is called a shotgun microphone, either mounted on top of your camera or a stand called a boom pole. The closer the microphone is to you (without being seen in the frame of your video), the better your audio quality will be in your videos. In your camera's settings, you will also want to adjust the audio input levels, do not leave this set to auto and do not activate any internal wind-noise filters or settings. To avoid the complication of trying to sync and match your audio and video in post-production (editing) I recommend running your microphone directly into the cameras audio-jack. Having good video quality is dependent on a lot of things but good lighting is one of them. When starting out you should try to do this as affordable as possible, most creators take advantage of natural lighting or buy brighter fluorescent bulbs for their room or lamps. A decent lighting setup usually cost at least $150, however you could get away with using an inexpensive ring-light from NEEWER for $80 as your primary light source. When you can invest in it, you should consider getting a 3 light setup or if you want to be more advanced or use a green screen in the future, purchase a 5 light setup. You're allowed to keep your video editing simple. The of the biggest channels on YouTube only use Jump-cuts and Color-Correction/Color-Grading, that's all they use in terms of editing techniques, and possibly some motion graphics (usually from templates). There are of course some genres that rely on more or less editing, but don't concentrate on this starting out. Expensive software is also something you don't necessarily need when you're starting out. The primary software used by larger YouTuber is Final Cut Pro and Adobe Premiere Pro, but many creators grow using simpler software that is more affordable or even free. Software exists to help you tell your story and to take out distractions, I won't go so far as to say it doesn't matter, because it can affect the speed at which you can finish a video that you are satisfied with. Most YouTube creators when getting started don't have a clue what their channel name should be. Changing your channel name can be difficult so I would recommend not taking this lightly. The simplest thing to do is to use your name, or a name you are comfortable going by such as a "stage name", Philp DeFranco originally was just a stage name before Phil changed it legally, iJustine is a branded nickname Justine Ezarik came up with for herself. If you are a younger creator or someone with a variety of interest, avoid using a name that is associated with what the channel is about, because you may decide to change the theme of your content as you change and evolve as a person. This could create confusion for viewers down the road. Another thing to avoid is trying to be too clever or quirky with your name. A name that is difficult to spell or remember can make it difficult for people to find you and your content, so you want to avoid that whenever possible. Keep it simple. Many creators take the about section of their channel for granted and use this to be quirky or sarcastic or leave it blank. The about section of your channel plays an important role. For one thing, when a viewer hovers over your profile pic in the comments section, or anywhere else they see your profile pic, the about section text will appear, telling them (hopefully) what your channel is all about. What I would recommend is in a few short sentences telling them what your channel is about and when you upload, in the first 2-3 lines of the about section. For the rest of it, I would recommend information that might be helpful to sponsors, or if you have P.O. Box you want brands or fans to send things to you, then you can include that information there. You need to remember that YouTube is a search engine, especially when you are beginning. When you are starting out people don't know who you are, and YouTube doesn't either. You can't expect the YouTube Algorithm or the community to work on your behalf when you're a new creator... but the search engine might. While I understand not everyone will want to do tutorials or educational content, and that most creators are entertainers or rather aspire to be, that doesn't mean you can't take advantage of the search engine that is YouTube, you simply might have to be more creative about your content strategy. I tend to help creators large and small work on their overall content strategy through coaching sessions, eventually, I will produce a course on the finer details of content strategy, because this is the foundation of success for your channel. The Title, Description and Keywords/Tags are what we refer to as YouTube Metadata, and this is the only CONTEXT the YouTube system (Algorithm), has to judge your video on. The YouTube system doesn't know how funny you are, or whether you are being sarcastic, or even if you are not being politically correct... what it does know, is that you entered certain words into certain fields, and like any good robot, it responds to the data that you, the human, gave it. The reason this is so important is that YouTube uses this metadata to match your content to viewers who watched similar videos and are looking for certain types of content. YouTube is a machine, it has no idea you videos are related to other Parody videos unless you tell it so in some way, it has no idea what your video is about and there are not people watching every single video uploaded to YouTube and deciding which ones get viewed by who. A system does this and based on who relevant it can determine a video is, that is how it will handle it. While you may see larger creators ignoring these rules, they are larger creators, so these rules do not apply to them because they already have an audience, name recognition, and usually articles written about them in major publications or post in Reddit, you can't expect what works for them to also work for you. So for time being it's best to ignore what the "Big YouTubers" are doing unless it comes to video production or video editing. You can make a video as great as you want, use all the fancy editing tricks in the world, and it won't help you grow. While quality content is important, getting the initial click is everything. Nobody will watch a video they never clicked on. You have to have interesting and enticing thumbnails in order to get clicks. YouTube recently revealed data to creators on their Click-Thru Rates (CTR) and it helps you understand that while YouTube can serve you content to millions, it can't force them to give it a chance and watch it... Your title and thumbnail have to do this. Your content is your responsibility. If you struggle with making quality thumbnails, I recommend looking into purchasing the YouTube Starter Kit, so that you can make competitive thumbnails with little difficulty. Closed Captions can help your videos because YouTube can better understand what your video is about when it has this information. Additionally, YouTube is a global platform, which means your content can reach people all around the world. Using English Closed Captions can help your video be more successful overall. This also means that you may have content accessible to the hearing impaired, which is a large but underrepresented group within the internet, and they are more likely to share content within their community which has closed captions. These are the features that have to do with how your channel looks. This is the way you can make yourself stand out from the crowd and part of how you get people to give your content a chance. Most small creators focus on trying to get the look and editing of their videos to look like the biggest channels, or buy better equipment. The simplest and fast way to make your channel look "big" is to make your channel "look big", by having visual branding (thumbnails and channel artwork) as good or better than the top channels in your niche or genre. YouTube thumbnails should either be 1280x720 or 1920x1080 and cannot exceed 2MB as a file size. They must be JPEG or PNG file formats. If you want to design good thumbnails you will need a program like Photoshop, Affinity or GIMP, alternatively, you can use a FREE browser-based editor called Photopea.com which will allow you to open Photoshop PSD files, like the ones provided in the YouTube Starter Kit. Making money on YouTube is a prospect that attracts many creators, but it is not as simple as deciding to become a YouTuber and get rich vlogging. YouTube has changed the requirements to become a YouTube partner and become eligible for Ad Revenue. They have also added other ways to monetize directly from the platform. However, the more lucrative route regardless of viewership or subscriber count is to monetize outside of the YouTube platform. There are many different ways to approach monetization on your channel. One of the most important things to consider is how to do so without alienating your audience. While making money with YouTube can help you fund your content and projects. if you want to grow your audience, you have to approach this strategically and making money cannot be the number one priority if you want to build trust with your audience. People will tell you that growing an audience is the hardest part. Those people are absolutely wrong. Growing an audience is not the hardest part. Growing an audience is a result. Results are not difficult at all, they are a conclusion, that is essentially their definition. Producing a result is what is hard. I really want you to think about what growing an audience means. The audience, at least initially, is not there for you, they are there for what you created, that is what being a YouTube Creator (YouTuber Means) creating content. You are either creating content for yourself because you want to, or creating content because you want it to be enjoyed by others. There is an overlap there, but if you are focused on growing an audience, then you are making content for them, not for you. Quality content is what every successful YouTuber will tell you is the secret to growth. While there is some truth to this, it oversimplifies it. Quality is in the eyes of the beholder, but there are some things that you can objectively identify. Video and audio production values, video editing technique, and a strong on-camera presence, these are things that we all identify as quality. Everything else is subjective, but the above are things that you need to focus on getting to the highest level you can before you have any expectation of growing an audience, that is the hard truth people don't want to accept. But then there is simple fact that you need people to pay attention to a video and click on it in the first place, which means that you have to have a compelling thumbnail and a powerful title, one that triggers emotion, gets searched or both. You also cannot rely on the YouTube system (YouTube Algorithm), to do all the work for you, which is the mistake of most creators. You need to take advantage of other social media platforms. Things like Sub4Sub and asking for people to check out your channel in the comments of other people's videos, is not going to cut it. In order to grow your audience that you should consider asking for people to SHARE YOUR VIDEOS, by asking for a share, you are increasing your views and overall reach. Getting shares in places like Reddit, Facebook, Twitter, and niche blogs or mainstream websites, is the fastest way to grow your YouTube channel. You can't just hope to go viral, that hasn't been sustainable for most creators who have been lucky enough to win that version of the lottery. At the same time, a shoutout doesn't guarantee you success or an audience just because it worked out for a few creators with VERY, VERY different circumstances than you. The way I grew my channel was using the skills I learned as a web designer, by focusing on the Search Engine that YouTube is since it's owned by Google. I focused almost exclusively on videos that could show up in a search. I also focused on making similar content so that I could dominate those search pages and own 4-5 spots on them. By doing this with weekly content for a year, and then nearly daily content for 2+ years, even when I diversified my content, I had hundreds of videos that would be relevant indefinitely, and whether I upload or not I still get thousands of views and hundreds of subscribers each and every day because of this strategy... it doesn't matter how well my new content performs today, because it will continue to accumulate views no matter what. In fact, this strategy is what grew my most successful video. The video on my channel that has over 1 Million views, got nearly all of those views, 6 months after I uploaded it. This is advice I'm giving to you even though I didn't exactly follow it myself. However, this has worked for my students in Awesome Creator Academy and has worked for people who have done 1-on-1 Coaching with me. When I started my channel, it did initially have a focus on Creative Tutorials, which mean mostly Adobe Software and topics like Photography, Video, and Design. This focus made it very easy for me to build a ton of content that had a specific group of people that were interested in the videos. Over time I expanded the range of my content to focus on a message that is broader... the idea of being empowered as a Creative and not being a Starving Artist. This approach did help me stand out, it did grow my community, my personal brand and spread a message that I feel matters, and this shift has helped grow my business, but you'll notice that it is not exactly crushing it when it comes to my View to Subscriber Ratio. Because I don't prioritize YouTube, this doesn't bother me (aside from the occasional comment pointing this out as if I'm blind and can't see the numbers). If you focus your content on a niche, and you get very specific about how your videos are unique from every other creator in that niche, then you have a reason for people to watch. Most creators who are not growing, cannot tell you why you should watch their videos. "I worked really hard on them", is not a reason. Ever creator has to choose between the content that will perform best on their channel and the content that means the most to them. If you wonder why YouTubers are stressed and burn out or get upset about changes in the YouTube Algorithm, this is the reason. The frustration with choosing between creative freedom, and success and frankly the judgment of casual viewers when their videos don't perform. Creators also often have to choose their priorities, doing meaningful content, content that makes money, content that will be popular, very few are fortunate enough to have their content do all of these things. Every single creator has to make this choice in some way regardless of what content they make, because you cannot please everyone, and you cannot serve everyone, those who try to fail faster than anyone else. Make a choice as to your priorities regarding your content, and learn to live with the outcomes the choice presents. Starting anything is hard, and it can feel discouraging when you don't see immediate results. If you choose to start a YouTube channel, posting every week regardless of growth the first year or two will be one of the hardest things you do, but if you can focus on your content and the way you make the people who are watching feel, then you will eventually find your voice and some version of your own success. This article is over 5,000 words and barely scratches the surface of everything that I had to learn in order to build an audience from zero, and the things I had to teach myself to grow to 10,000 that first 12 months after posting weekly, let alone what it took to grow by 6,000-10,000 new subscribers a month during the time I was uploading daily. The truth is that success is never guaranteed, but if you don't try and you don't show up then failure is guaranteed. If you choose to pursue YouTube my hope is that you do it with open eyes and for the right reasons.